So my hubby and I went to the 3rd Annual National Heirloom Festival yesterday at the Sonoma County Fairgrounds where fecundity flourished. Seeds galore and becoup info on why to oppose GMOS-gene modified organisms. It is a mantra I intuitively agree with, along with nine other countries, like Italy, France, Germany, Greece, Luxumbourg, Austria, Hungary and Poland which ban Monsantos GMO corn. In fact, Monsanto has abandoned it’s GMO crop push in Europe. 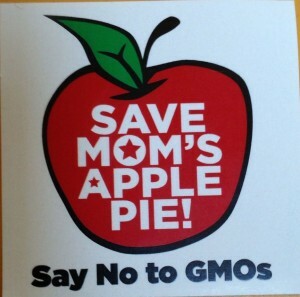 It’s interesting how those against GMOs connect it to being anti mom’s apple pie. I spent a great deal of time by the Santa Cruz County based Mountain Feed and Farm Supply who had a huge display of fermenting veggies. And for a mere 20 dollars you could own one of the gizmos to get you on your way to fermenting every food morsel in sight, as long as it fit into the half gallon Mason jars, whose top had a strange looking tube sticking out of it. ( Wish I had taken a photo.) Click here they look like this. Anyhow, I asked the young woman why I needed that little contraption when I had already successfully made traditionall “Jewish pickles’ using only salt brine, a crust of rye bread, fresh cukes placed in a clean crock, topped with gauze, and a platter held down with a cleaned flat rack. “Oh You don’t,” she said, “Go ahead and continue doing what you do. This is just for people who are afraid to begin fermenting food. It’a a beginner kit. You’re obviously past this.” This made me feel great. “Will do,” I smiled back feeling part of the fermenting nation. But she got me thinking I really should upgrade my system. I mean using an old crock pot insert and a flat rock? I was better than that. Maybe I did need that five gallon crock all set up with weights for holding down the pickles in the brine, and a water seal lid, imported from Poland, no less, the very land of my ancestors. At $140.00 it was still tempting but way too large, although it was the size my grandfather, Constanty Lupinski might have used in his Polish deli/grocery store in Irvington, New Jersey in the 1930’s-50’s. I wasn’t ready for that much fermenting, “Do you have anything smaller?” I asked. “Yes, but we’re out. You can pay for it now, and we’ll ship it for free.” “I’ll think about it,” I said. I sauntered on. Well it didn’t take me long to get pulled in at the Architectural Ceramic Design station. Wow, Here was a bevy of rainbow colored, hand-hewn pottery. 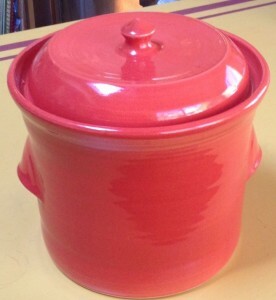 and amid all that sat several fermenting crocks–all in various colors, from red to yellow to orange. “People are getting back into fermenting,” Alan the potter said. No kidding, I thought. Gee I was one of the forerunners of a trend. I puffed out my chest and took in all the simply devine colors. (hint: click on the website to see them, you’ll see what I mean). Plus the feel of the items is light, yet you know it is handmade. “I used to work in a beauty salon,” said Donna his wife and potter partner, “I know how to throw and blend colors.” It was apparent to me she was expert at it and putting all of her color energy into the pottery business as I looked at her lovely long but natural grey hair. Okay so I bought the red,orangey one. My grandad would be proud. And I even found a recipe for pickled apples which is a good thing since our golden delicious tree gave us five bushels this year. All in all it was a a good day yesterday and I feel connected not only to my own heritage, but to so many others, (mothers and fathers) who also used the process to survive way before refrigeration was a gleam in anyone’s eye. This entry was posted in Uncategorized by Elaine Maikovska. Bookmark the permalink.